A Cubana Airlines flight crashed after taking off from Havana's Jose Marti airport on May 18, 2018. What happened: A Cuban airplane crashed at takeoff from Havana airport. More than 100 people were on board the Cubana Airlines flight. The victims: Cuban authorities believe more than 100 people were killed, state-run media reported. Our live coverage has ended. Go here or scroll through the posts below to read about the plane crash. The Mexican Civil Aviation Authority has said that five crew members aboard the plane that crashed in Cuba were Mexican nationals. Mexican authorities added the Boeing 737-200 series, owned by Mexican company Damojh airlines and leased to Cubana de Aviacion, was nearly 30 years old. The Mexican Civil Aviation Authority said the plane was taking off from Havana's airport Havana when it "suffered a failure and crashed into the ground." The crash occurred six miles from the airport. The aircraft was headed to Holguín, Cuba. The Mexican Embassy in Havana has activated emergency protocols. 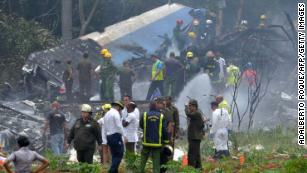 Cuban officials fear that more than 100 people have died in the crash, according to Cuban state news. Cuba TV reports that the General Calixto Garcia University Hospital received and are treating the only three survivors. Cuban President Miguel Diaz-Canel lamented Friday's plane crash and said that authorities would investigate the crash. He said a fire that erupted after the crash was extinguished. Diaz-Canel said no bystanders were injured and no homes were damaged at the site of the plane crash. Diaz-Canel, speaking to journalists on Friday at the crash site, said he sent "condolences to the families for this tragic accident." Venezuelan President Nicolás Maduro took to Twitter to send his condolences to the families of the victims of today's plane crash in Cuba. “Strength and peace for them in their times of pain, they have all our support,” Maduro tweeted. Cuban President Miguel Díaz-Canel at the scene of the crash. Three passengers who were on board the plane that crashed in Cuba are in critical condition, Cuba state-run Granma reports. Cuban President Miguel Díaz-Canel is at the scene of the crash. These photos were taken at the scene of the accident after a Cubana Airlines flight crashed after taking off from Havana's Jose Marti airport this afternoon. There were more than 100 people on board. The footage below appears to show smoke rising from site of the Cubana Airlines flight crash, near José Martí International Airport in Havana, Cuba. Cuban state media reports that there were 104 people on board a plane that crashed shortly after takeoff at Havana's airport. Boeing 737 plane was heading to the Cuban city of Holguin. It is still unknown if there were fatalities.